Akita-ken doesn’t hold the world record for very many things. Our humble prefecture, despite having the most fruitful rice and soybean production in Japan, doesn’t lay claim to many ~est’s on a world scale. However, in the tiny town of Takanosu, a frontrunner does appear with both impressive stature and sound : the taiko. Yes, Akita houses the world’s largest taiko drum in a large structure in the north of the ken. At 3.71 meters tall and weighing 3 tons, the drum is used every July in a local festival, where instead of beating the taiko from the front as usual, drummers perch on the top and beat down on it with long sticks from above. 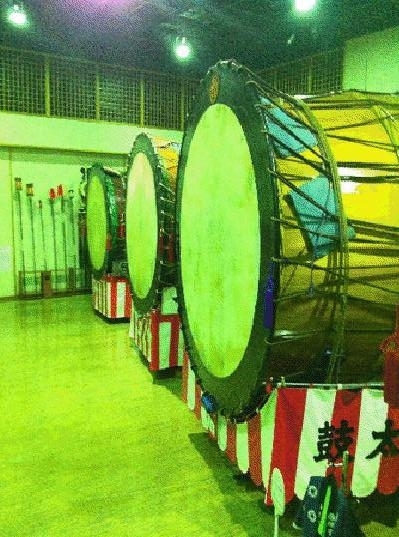 The taiko drums are on display year-round at the Takanasu Giant Drum Musuem (Oodaiko no Yakata). About a ten minute taxi ride from the station (though buses do make the run as well) and a 410 yen entry fee, the odaikokan features the largest taiko drum and it’s close second, third, and fourth place-sized cousins, a short video of the taikos in action in the summer festival, an interactive display of drums from around the world, and small taikos on which you can try out your own skills. Although interesting, and, honestly, who doesn’t love a good Guinness World Record holder!, the museum doesn’t require more than a 20-minute tops look-see, to snap some photos and play a little taiko. Still worth a visit for something you literally cannot see anywhere else in the world. The spot for the biggest taiko eh? Interesting heh.